I was diagnosed after in 1995 at the age of 18. My brother was admitted to hospital with a throat swelling. I had the condition along with my Mother, Sister and Brother. Post diagnosis I don’t recall back to having attacks but mum recalls occasions where I did get swellings. I was prescribed Stanazlol to be taken daily, and the types of attacks I have generally suffered are in the Feet, Hands, Groin and Abdomen. I now take Danazol (200mg per day) and I have Firazyr as emergency medication. I have been married for 12 years and we have 3 children, Louie, Amelia and Mia. Louie has Type 1 and has suffered quite badly over the last few years with multiple hand and feet attacks and a throat swelling. The girls do not have HAE so that is great! I work full time in Manufacturing Senior Management and have experienced multiple periods of high pressure where at times I have been working up to 60 hours per week. I have always tried to manage pressure but this is not always easy. I did go through a period where I had 12 months of attacks and this was directly an effect of work. I started a new role and my previous attack was 2 years prior. I started to do less exercise and was more stressed. As a consequence I suffered more attacks…… I took action though and changed my role in the business. I think this is an important point. If you can attribute things in your life that cause you issues, take action and change them…. I was always pretty fit growing up, playing a combination of football and tennis, but in my late teens I spent the next decade or so partying. I had a great time spending most of my weekend’s DJ’ing or clubbing. My diet was very poor during this time, I was over 15st and smoked 15 cigarettes a day. I did suffer a number of attacks throughout that period of my life with 1 hospitalisation. These attacks were abdominal, and in my feet and hands. I have always found that fitness and strength have helped me in my management of HAE. I got into running after getting bored walking the 2.5 miles home from work. I had a little jog and it didn’t kill me so I decided to run a bit more. I have since gone on to race circa 20 half marathons and 5 marathons. I did get the odd swelling in my feet upon taking up running and I guess this is something else I have learned. Don’t rush, your body can take time to adapt to new situations and if you get a little set back don’t let it put you off. I did start to get knee issues from running so I thought it would be good to mix up my training so I thought I’d take up Triathlon. I entered a Triathlon and I couldn’t swim a length of the pool without stopping. 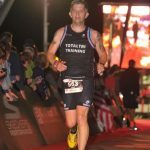 I joined a tri club who put on various training sessions over the week. My first spin class was great but after I suffered a groin swelling, and I thought “oh what had I done”! But much like my running experience I carried on once the swelling had gone. I didn’t let it put me off. Over the next 4 years I raced sprints, Olympic, half ironman and full ironman distance which is a 2.4 mile swim, 112 mile bike and a 26.2 mile run, all in one day. I have completed 2 full ironman races now and all this after having a knee operation in 2013 too. I didn’t let that stop me either. I do think I am addicted to taking part in events, this is where I get a real buzz and I have to push boundaries. Over time issues reduce and now I don’t get any HAE type attacks when I run or cycle. I’ve learned how to adapt to new situations and reduce the trauma effect of trying something new. Keeping fit definitely helped me in a number of ways; with work it was an outlet for me, and a way of getting rid of excess adrenaline. I have found it an excellent way of clearing my mind and processing the day. I am physically strong so this makes me less susceptible to traumas. I also have ulcerative colitis (UC), an inflammatory bowel disease. Some symptoms are similar to HAE and I feel that UC can interfere with HAE too. This is another complication but it is something that just needs to be managed. So what have I learned? I keep an eye on my immune system, if I have colds etc I am very careful. If I have hard training sessions or periods, I make sure I get enough rest. Most importantly don’t give up on your dreams! They are achievable and a positive attitude and a measured approach has taken me on some amazing adventures.